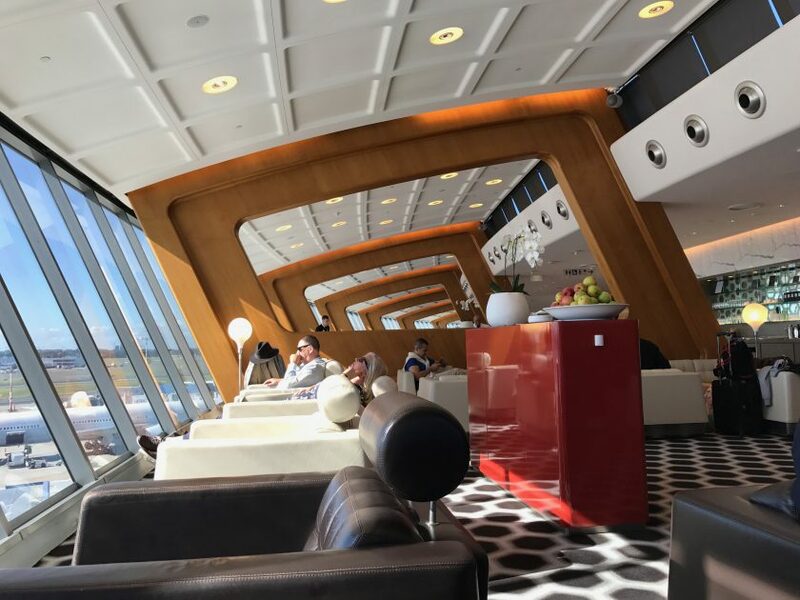 The Qantas first class lounge in Sydney has been covered on lots of blogs before, however I wanted to do a brief review of it now that it’s had its tenth anniversary. After all, that’s a long time to try and keep the crown of one of the best lounge experiences in the world. 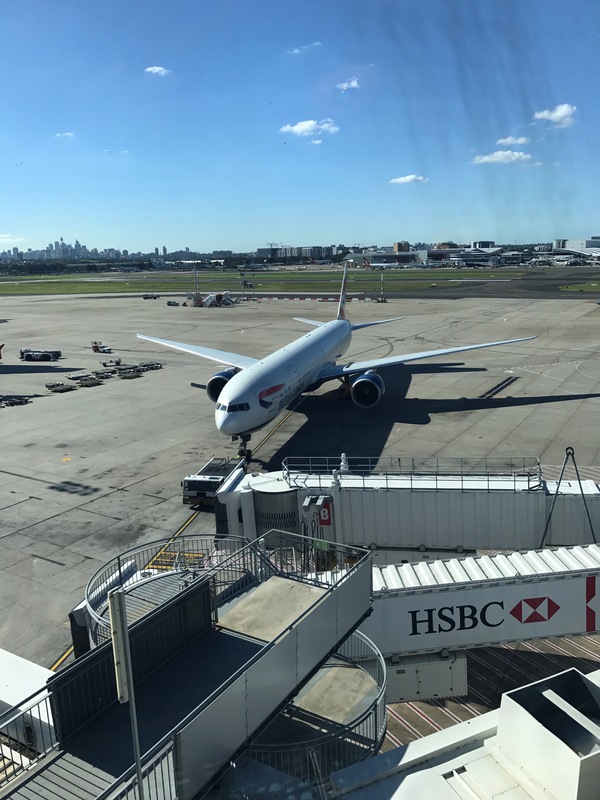 I was travelling from Melbourne domestically on Qantas, connecting in Sydney through to the BA016, which travels up to Singapore and then on to London. I checked in my bags at the domestic terminal in Melbourne, and was issues boarding passes all the way through. Both travelling in first and also being a oneworld emerald meant I had access to the facility. Connecting between international and domestic services in Sydney is a bit of a pain; they’re in separate terminals so there’s a bus between the two which takes about ten minutes and leaves every ten minutes in the morning, and every twenty in the afternoon. Arriving at the international terminal, you’re dumped in the corner of the landside check-in area. My bags were checked through and boarding passes in hand, so I wandered to the Express immigration line and security. At about 11.00am both were very quiet and the whole thing took about ten minutes. After taking the mandatory walk through the Duty Free, I found the entrance to the Qantas lounge. The lady at the counter took my boarding pass, and welcomed me by name. She also offered me a spa treatment which I readily accepted. This was the view from the corner of the lounge. After an hour or so, I decided to have lunch. 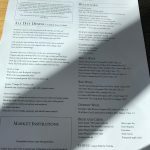 The food is provided by Rockpool and the menu rather extensive. 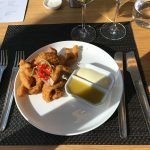 I started with the salt and pepper squid, and then moved on to the sticky beef. In addition to the wines on the menu, they also had an extra selection, already decanted. I decided to have a glass of that with my main course. 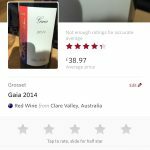 I took a snap of the label with Vivino. Before long, 13.00 rolled around and it was time for my spa treatment. The treatments are in 30 minute slots, so last around 20 minutes. 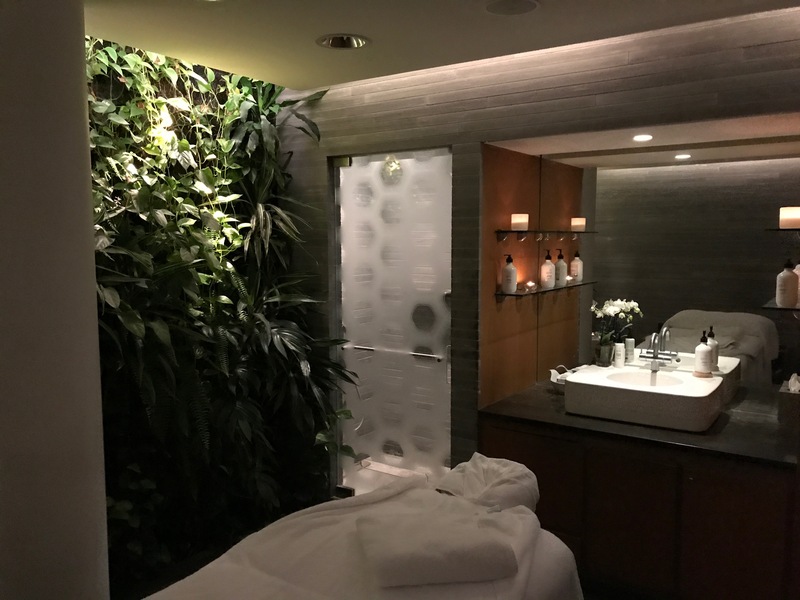 I opted for a back massage and it’s one of the best ways to relax before a long-haul flight! The view from the lounge is awesome and luckily it turns out the BA016 that day was from the gate directly below as I was able to watch it being towed to the gate. 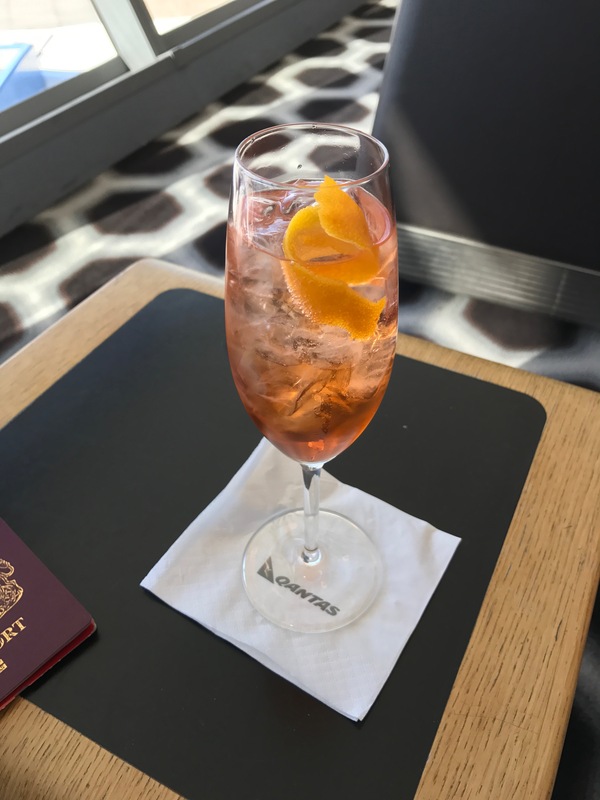 I decided there was time for one more cocktail, a gin spritz to refresh and fortify me for the long, arduous journey! My only criticism of the Qantas lounge is that they do announce every single flight, which means that the atmosphere suffers a little from a tannoy announcement every few minutes. However they called the BA016 and it was time for met to head down and start the journey back to the UK. Overall, having been to the first lounge here a few times before, it’s lost nothing in the past ten years. 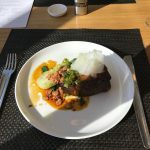 The staff are still very much on the ball, the food is still great and the spa services awesome. If every you needed an excuse to go to Australia, this is it. Previous Post: Brisbane and Melbourne. A tale of two hotels. Next Post: The great British Airways Champagne crisis.